The controversial Olympics in Rio are coming to an end, with just a few days left of competition emotions are running high. Brazilian fans have been scolded for their treatment towards any athlete that dares challenge one of their own; the battle for Olympic gold in soccer could become a cataclysmic scenario given the rivalry between both countries in this sport. Brazil’s soccer fans have been waiting for this match for a long time, proof of this was when it was clear that Brazil would beat Honduras in the Semifinal, fans began to chant “Germany just you wait, your time is coming” even though Germany had not even begun their match against Nigeria. Everyone seems to view this game as a revenge match from the unforgettable semi-final match in the 2014 World Cup where Germany humiliated Brazil by winning 7-1, an outcome no one expected. 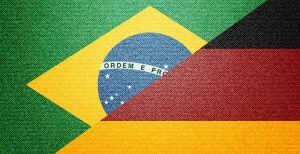 Despite the sport’s popularity in both countries, neither has won gold in the Olympics (East Germany won in 1976 but a unified Germany has yet to win the gold medal in soccer), the Germans claim they are not bothered by this but Brazil views this as a thorn on its side that must be removed at all costs. This would be the perfect scenario for Brazil to win the gold, they would win on their own soil, in their signature stadium The Maracaná, with tens of thousands of their most loyal fans cheering them on. They are so determined to win that they have made sure their top players from every league traveled home to join the Olympic team, they even called up Neymar taking advantage of the fact that they are allowed to have 3 players that are not in the under-23 category. Germany on the other hand, was reluctant to have their top rank players prioritize the Olympics preferring them to focus on the Bundesliga instead, clubs are not obligated to let their players miss regular games to participate in the Olympics, so this would seem to place them at a disadvantage. But you can never count Germany out, they are great and very determined players. The fact that Brazil wants this so badly could be a double edge sword, they will either allow their emotions to get the best of them and falter as a result or they will battle to the bitter end to get the prized gold medal. I think the game will spectacular regardless of, but in the end the cool headed Germans will take gold, the pressure to over perform will be too great for the young Brazilian athletes. Make sure to get your action in at AceSportsbook.com and be part of this historic soccer match.